This cozy, fully-equipped log home overlooks Pickerel Slough, an inlet of Mirror Lake. The cabin has a sandstone wood-burning fireplace in the living room, full kitchen and one bath. 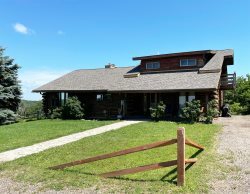 There are stairs (fairly steep) to a boat dock for fishing in the summer, or use the trails throughout the woods for cross-country skiing and snowmobiling in the winter making this home great for all seasons. The serenity of a simpler time might be hard to summon—until you arrive at this tranquil no-wake lake surrounded by sandstone bluffs towering along its shoreline. 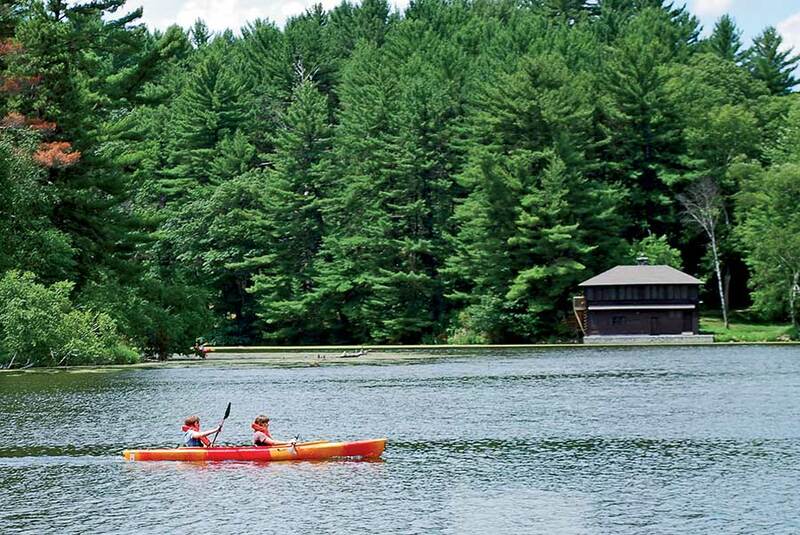 Named for its glassy surface, the jewel of 2,200-acre Mirror Lake State Park, just a few minutes (yet an entire world) away from the Wisconsin Dells, is encircled by an unspoiled forest. Click on picture to read full article. The only person with whom I spoke was at the time of key pick up and he was very nice and accommodating. We really enjoyed our stay and would consider staying again. Beautiful and well-appointed log cabin with homey wood fireplace. Definitely peaceful. the setting and decor were great, loved the "up north" actual log cabin. Thank you for providing these homes for rental. The team was excellent, polite and professional. We enjoyed the entire experience. We are planning on renting again soon. Wonderful, friendly, knowledgeable, really outstanding! Wish I could live there all the time!! WONDERFUL!!! We have rented from Sand County every year for over 10 years and have NEVER had a bad experience. Have already reserved time in the spring for this property. It is hands down our favorite property and can not even count how many times we have rented it. We originally rented this cabin because it is dog friendly (still is) and continue to rent even though we no longer have a dog. As our family continued to grow and we toyed with looking for another property that had two bathrooms the idea was immediately shoot down...so we tease about getting a porta potty every year and make due with the one bathroom. We had an overall A rated experience. Staff was great as usual.Nice people to work with. Thank you every one. Very nice place to stay. We will be back again next year. We have rented with Sand County for years and have always been thrilled by our experience with them! They are always friendly and ready to help. No problem is to big or small (or silly) for them to handle. A huge "Thank you" to all for another WONDERFUL vacation...we will be seeing you all again soon! Please pass on to the property owner that we really enjoy their cabin, the new upgrades and really appreciate them sharing it with us! They were very friendly at all times. Very quiet, secluded and comfortable cabin. We will likely rent it again in the future. Very nice cabin with knotty pine throughout. So quiet, slept like a rock while there. Peaceful Pines was a great place to relax and get away from the busy city life. It was a bit too secluded for me just due to the fact of all the windows in this place! It sure gives you an amazing view of your surroundings during the day but at night it can feel kind of like a scary movie because there was not curtains that could be closed. Overall, we loved our stay and are coming up on our 3rd stay with Sand County with many more to come!! George was very friendly - overall experience was great! from day 1 thill now thay are the best staff and team thay make you feel like this is home we love all the staff at sand county.